List Your Western Recreational Vehicles & Reach THOUSANDS of Buyers - Instantly! 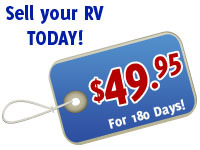 For only $49.95, your Western Recreational Vehicles for Sale ad will be featured on one of the most popular RV Classified sites – reaching over 1.5 million visitors per month. RVUSA has the right mix of traffic, price and value-added features to help you sell your RV now!! So what are you waiting for? You won't find a better value. Sell Your Western Recreational Vehicles Today!